Toward the end of their workweek on a Fuller Center Global Builders trip to Thailand in January, volunteers from Berkeley, California’s First Presbyterian Church were asked if they had ever seen a house with one wall. The team, led by Tim Buscheck, was intrigued. The house belonged to an electrician named Jareorn, who had performed work on several Fuller Center homes in Lampang. In his early 50s, he lived there with his mother, Boonma, who is in her early 70s. What the team saw when they arrived at Jareorn’s house was indeed a structure with just one wall. It did have a solid roof held up by strong posts, but its floors were dirt, and there was just one partial solid wall. In lieu of walls in other areas were woven bamboo and other screen materials. Sleeping areas were protected by mosquito nets. Though Jareorn’s income as an electrician is modest, it was enough to qualify for a Fuller Center home. The challenge, though, would be securing funds to quickly build a new home. Fortunately, upon returning home Buscheck’s team enlisted help from their First Presbyterian Church family and raised the funds needs for a simple, decent home — with four solid outside walls. In late April, local construction workers who had labored alongside the church volunteers earlier this year started the new home with solid foundations, a concrete slab floor, concrete block walls inside and out, a steel roof frame and corrugated concrete roofing. The outside and inside walls were stuccoed and painted, and the floors all finished in ceramic tile. 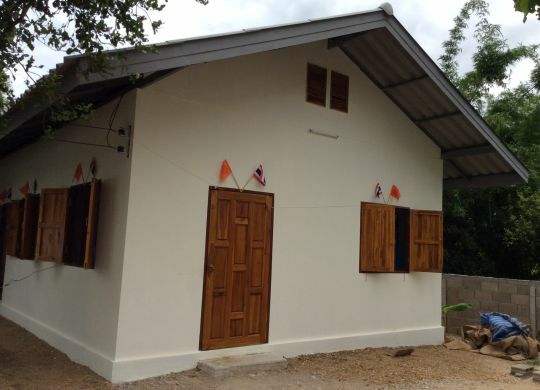 The completed new home — with real walls, two bedrooms, a living area, kitchen and indoor bathroom (instead of the outhouse they formerly had) — was dedicated.